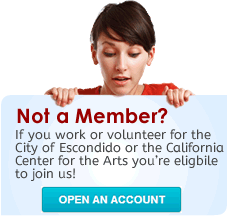 Escondido Federal Credit Union's Holiday Club Account offers flexibility for building up savings. We have many options in setting up automatic monthly transfers to to your Holiday Club Account, and can even arrange for part of your direct deposit to be automatically set aside into your Holiday Club Account. Of course, you can also drop by one of our branches and make a deposit to your Holiday Club Account, as well. Dividends calculated daily and compounded (paid) monthly. A dividend rate higher than for-profit financial institutions when you keep at least $50 in the account. No monthly fee when a low minimum balance requirement is met: $1 for the Holiday Club Account. Anytime access by phone (ARTS line) and online banking for balances and transfers Automatic loan payments from your savings account, saving you the hassle. NCUA insured up to $250,000 for complete peace of mind. Funds will be transferred to your Regular Share Account on or about November 1 each year. Withdrawal of funds will result in an Early Holiday Club Withdrawal Fee as disclosed on our Account Fees Schedule. Upon the second withdrawal the account will be closed and the remaining funds will be transferred to your Regular Share Account.